Blowout Sale! Free Shipping Included! 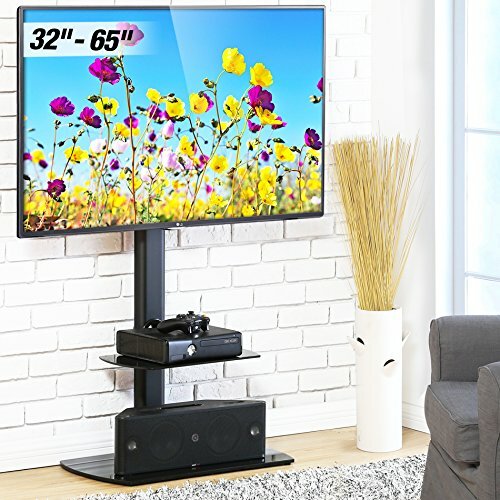 Save 63% on the Fitueyes Floor TV Stand with Swivel Mount Height Adjustable Bracket VESA patterns up to 600mm x 400mm for 32 to 65 inch LCD, LED Oled TVs TT206502GB by Fitueyes at RVTE. MPN: TT206502GB. Hurry! Limited time offer. Offer valid only while supplies last. TV COMPATIBILITY -- Fit for 32 to 65 inch TVs ,VESA patterns 100x100/200x100/200x200/300x200/300x300/400x200/400x300/400x400/600x400, TV brands such as Samsung LG Electronics Sony Sharp Panasonic Philips Vizomax Cello Bush Blaupunkt JVC Hitachi Hisense Goodmans Finlux Toshiba flat panel or curved LCD LED OLED QLED Plasma TVs . SAFETY DESIGN and WEIGHT CAPACITY -- 110 lbs weight loading capacity. Thick and black 8mm safety tempered glass shelf built up a strong tv stand base to support your TVs and audio vidio components . Safty "Bracket Lock" design to protect your TV not falling down or sliping aside. MULTIFUNCTIONAL -- This floor TV stand with universal height adjustable TV mount designed for most brands most type 32-65 inch TVs. It can update your oringnal TV base , also can instead of a wall mount TV bracket but no need to drill your beautiful wall . CABLE MANAGEMENT -this TV stand furniture including cable management and wide enough media shelf to hold your Audio Video Accessories such as DVR DVD Bluray Players Cable Boxes Consoles Satellite XBox PS3 . ASSEMBLE EASLY -- High quality products comes from ISO certificated good quality contronl suppliers , very easy step by step instructions to set up WITHOUT extral expert assembly will save your money and take you confidence.